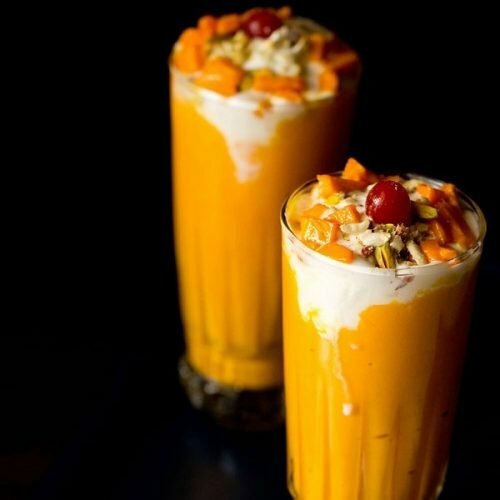 mango mastani drink - a popular dessert drink from pune. thick mango milkshake topped with vanilla or mango ice cream. slice a few dry fruits like pistachios, almonds and cashews. keep them aside with 4 to 5 glazed cherries. peel, chop 3 large mangoes and add them to the blender. reserve a few chopped mangoes aside for topping the mastani drink later. add 2 to 3 tbsp sugar. add 1.5 cups full cream milk. blend to a smooth thick milkshake. taste and if the sugar is less, then you can add more. if the mangoes are very sweet, you can completely skip the sugar. pour this thick mango milkshake in glasses till you have enough space at top for ice cream scoops. place one or two vanilla or mango ice cream scoops. top with the sliced dry fruits and chopped mangoes. garnish with the glazed cherries. serve mango mastani immediately with a spoon as well as straw.